Laurel Rowan is determined to find her estranged grandmother. She wants answers to some questions she has after her visit to Cornwall. Laurel needs to know why her father is so angry with Gramma Bella. Arriving in the hamlet of Bragg Creek, Alberta, Laurel is disappointed to find the person she is seeking isn’t at home. A Christmas visit to her friends in Cornwall seems like a good idea, after all that’s where all the questions started. 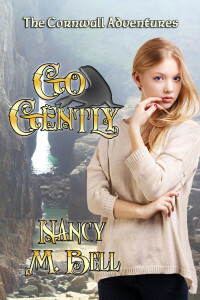 What she finds there is both exciting and disturbing and sends Laurel and her group of friends off on another adventure over the windswept moors and down the narrow winding streets of Cornish villages. The biggest question is: Where is Gramma Bella and what does Vear Du know about it? Laurel Rowan paced the weathered front porch, scanning the range road for the rooster trails of dust Chance’s truck would throw up. She heaved a sigh and leaned on the thick log railing, letting the wind blow through her hair. Impatiently, she straightened up and whirled around. Snatching her large bag off the bench by the wall, she rummaged for her cell phone. Chance was never late, why would he pick today of all days to not show up on time? Her pony tail swished behind her as she stalked over to the post at the top of the stairs and leaned a hip against it. She glanced at the cell phone screen before starting the call to check how many bars were showing. “I’m just turning in the lane.” Chance answered before the phone barely had a chance to ring. The sun flashed off the windshield as the blue pickup came around the last bend at the top of the small coulee. Dust settled as he stopped in the yard. Laurel tossed her phone back in the bag and looped it over her shoulder before she jumped down the three shallow steps. Waving, she ran lightly across the grass toward him. Chance stepped out of the cab and removed his hat, slapping it on his thigh. The November sun slanted across the prairie, highlighting his strong features and intensifying the blue of his eyes. “Where’s Carlene? I thought she was coming with us.” Laurel glanced at the empty cab. “She changed her mind.” Chance shuffled his feet and dropped his gaze. “What do you mean…changed her mind?” She pressed him for more information. He mumbled something she didn’t catch, slapped his Stetson back on his head and climbed into the truck. Laurel yanked open the passenger door, threw the bag onto the seat and swung up into the high cab. She fastened her seat belt and turned toward the boy behind the wheel. He’d stuck sunglasses on his face and she couldn’t read his expression. “Ain’t nothin’, let it lie, will you?” Chance started the truck and slid it into gear. “It is so something. You think I can’t tell when something’s bothering you? You and Carlene have a fight?” Laurel poked him in the arm with her finger. “You tell me right now or I’m getting out right here.” She made a show of reaching for the buckle of the seatbelt. Strong fingers closed over her hand, stopping her motions. Startled, Laurel looked down at the tanned hand that covered hers before meeting his gaze. The truck rolled to a stop as Chance engaged the clutch. She swallowed hard, discomforted by the intensity in his face. “Don’t be an idiot.” A dark flush coloured his cheeks under the day old stubble. “Ever since you got back from England last year, you’ve been different somehow. I never know what you’re thinking any more…” His voice trailed off and he released her hand. Dipping his head so the brim of the Stetson threw his face into shadow, Chance released the clutch and allowed the pickup to gather speed. “I don’t know, but Mom is on my side…and I can so keep a secret, so there.” She resisted the urge to stick her tongue out at him. “Leave it alone, Laurel.” Chance slowed at the end of the lane and glanced both ways before pulling out onto the paved highway. “C ‘mon, spill it.” She poked him in the ribs hard enough to make him wince. Flashing her an angry glance, he sighed and shook his head. “Fine. I told her not to come so I could spend some time with you. Alone.” His jaw clenched. “What?” Laurel struggled to process his words and the meaning behind them. Chance quit talking and concentrated on the road, but Laurel was pretty sure he still had something stuck in his craw. “All you ever talk about to Carly about is that guy in Cornwall. “He’s my friend!” she defended herself. Laurel scrunched down in the seat as far as the seatbelt would let her and refused to look across the cab at the driver. The vehicle slowed as they went through Lundbreck. Laurel shook her head, still refusing to look at him. Out of the corner of her eye she saw the rise and fall of his shoulders as he shrugged. Once out of Lundbreck he picked up speed again. At the junction of Highway 3 and 22, Chance turned north on 22. The road wound its way through the towering mountains, the poplar trees were bare of the brilliant gold leaves, leaving only stark branches showing against the blue green of the conifers. Usually, Laurel loved this drive but her annoyance with Chance soured the experience. It was the last time this year she’d be able to go this way before the National Parks closed the highway at Highwood House. Chance seemed as disinclined to talk as she was. She plugged her MP3 player into the dock and set it to play to break the awkward silence. No luck with getting a radio or cell phone signal this deep in the wilderness. “No idea, I should have brought a map. There’s the post office, let’s ask there.” Laurel opened the door and slid down out of the truck. “Are you coming?” She turned to look at Chance. “Nah, I’ll just wait here.” He switched off the truck. “Suit yourself.” Laurel shrugged and turned her collar up against the wind whipping through the tiny parking lot. She ignored the surge of irritation. Chance had a burr under his saddle, that was for sure. What was so difficult about coming with her to the post office? And what was with his acting jealous of Coll? Reaching her destination, she pulled open the door and banished all thoughts of Coll and Chance. Today was about finding Gramma Bella. There was no one waiting so Laurel smiled at the lady who was sorting mail behind the counter. “How can I help you?” The woman set the bundle of letters down and came to the counter. “What’s your grandmother’s name?” The woman peered at Laurel intently. “Bella.” She shuffled her feet, unnerved by the directness of the post mistress’ stare. “So, she does still live here?” A thrill of excitement spiraled through her as she waited for the response. “Thanks,” Laurel called. She almost raced out the door, the ratty envelope clutched in her hand. “I got directions,” she announced when she re-joined Chance. “Where do we go from here?’ He turned on the ignition and slid the shifter into first gear, the clutch still depressed. “Go out onto Balsam, which is right there, and then turn right at the stop sign.” She pointed at the busy corner. They stopped at the four way stop and waited their turn. “Yeah, the sign says White Avenue. So far so good.” Chance made the turn after the large truck coming down highway 22 went through. “Look for street numbers, will you, Laurel?” The narrow road was hemmed in with tall spruce and fir and still looked a bit the worse for wear from the huge flood of June 2013. A number of damaged houses were up for sale. “Keep looking, I hope we’re going in the right direction,” Chance sounded doubtful. “Look, there’s the river.” Chance pointed ahead where the thick growth of trees thinned out. “There’s the trading post.” Laurel bounced with excitement as the pickup rounded a wide curve in the road. The land rose sharply upward on the left, the road ran beside the river on the right. “This is where they filmed a lot of that old TV show, North of 60,” Chance remarked. “The address is right,” Laurel said. Feeling like a hundred elephants were sitting on her chest, she got out of the truck and came around the front to join him. “Not really, but let’s do it anyway.” Laurel found it hard to get the words past the lump in her throat. Three broad shallow steps led up to a small porch. Laurel raised her hand to knock, but hesitated. A hundred doubts racing through her thoughts. She half turned to run back to the truck, but then whirled back and knocked loudly on the red painted door. Chance moved nearer until his shoulder touched hers. The contact was reassuring and helped calm her anxiety and steady the racing of her heart. They waited a moment or two, but there was no response. Laurel knocked again and stepped back a pace. After a few minutes of silence, she looked up at Chance and shrugged. “She must be out.” Laurel’s voice wavered a bit.